The church building seen at left is the Methodist Episcopal Church, built in 1883. 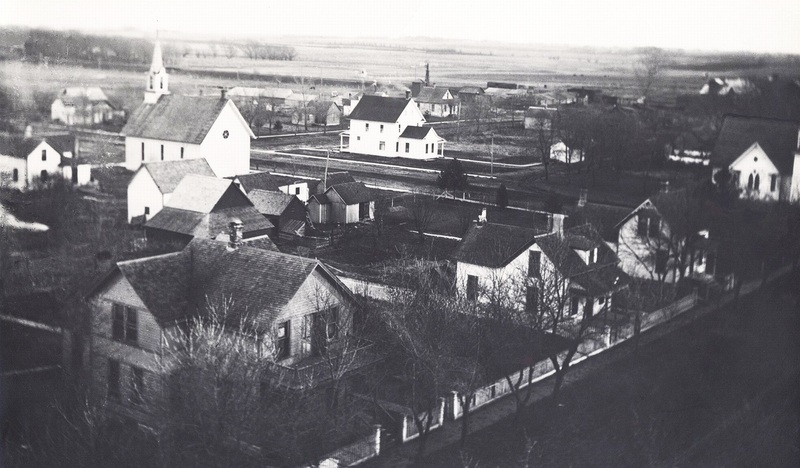 The church partially seen at the far right was the Congregational Church, constructed in 1903. Dayton Street visible at left, with DeWitt at right. The house in the center has the address of 1531 Dayton. 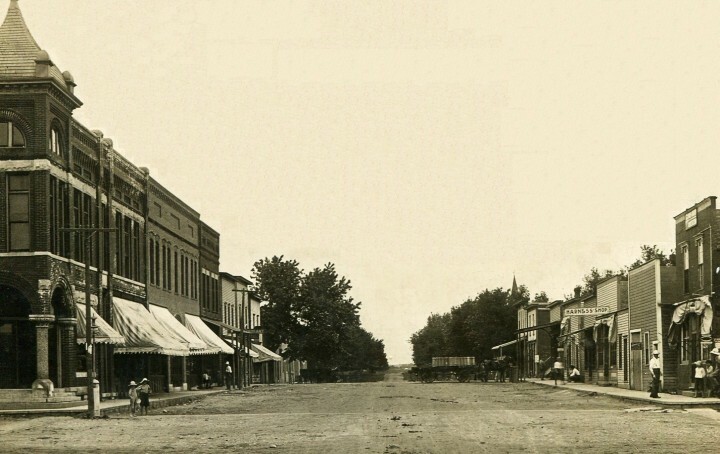 Iowa Highway 175 is visible at the top of the image, and the east-west street seen in the center of this image is Des Moines Avenue. These two images were taken by Peter Holt from the belfry of the Lutheran Church. 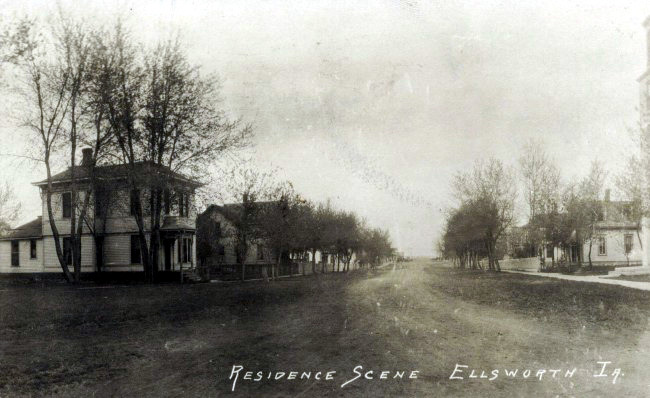 The photo above shows the portion of Ellsworth that was southeast from the church. 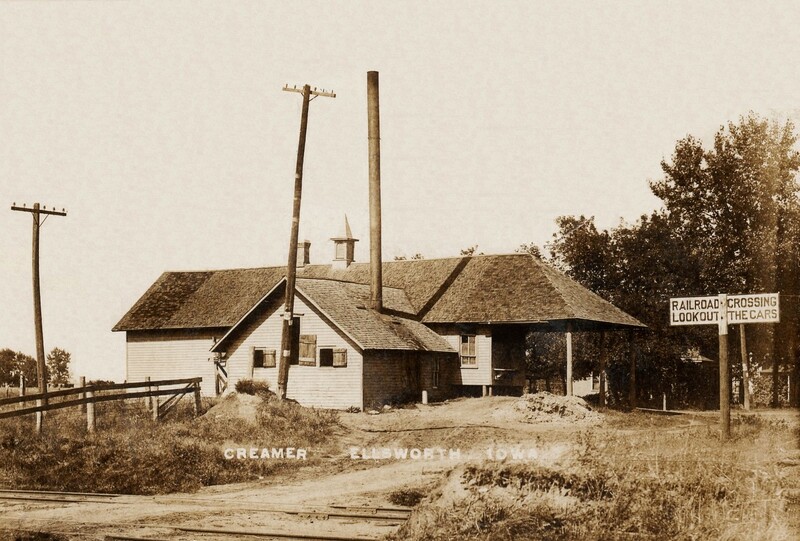 The photo below shows the part of Ellsworth that was southwest of the church. 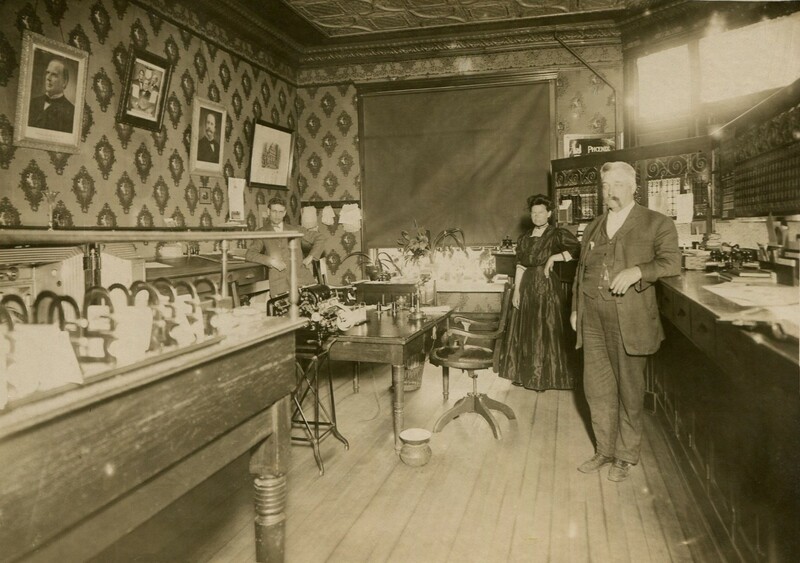 These were captured on glass plate negatives about 1900 to 1905. Glass plate negatives are a bit similar to lantern slides. Those negatives were scanned in 1980. 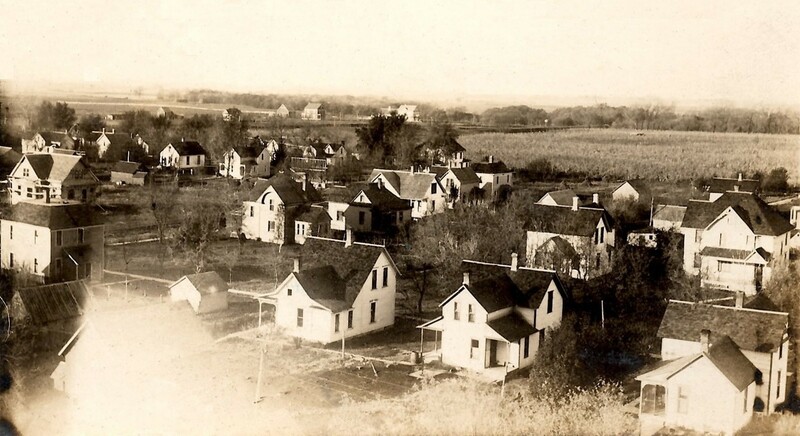 This second early aerial photo shows another portion of Ellsworth from the Lutheran Church belfrey. The eight most noticeable houses are along the present DeSota Street. Those in the foreground are, from left, the former Olger Lenning house, the Dale Thompson house, the Wilford Rash house, and the Ernie Johnson house. Across the street are the house where Jim Kooker lived, the Lloyd Tuchek house, Anna Johnson's house, and Mrs. Wilke Heeren's house. If this photo were wider, Jewell Junction would be visible in the distance towards the right. 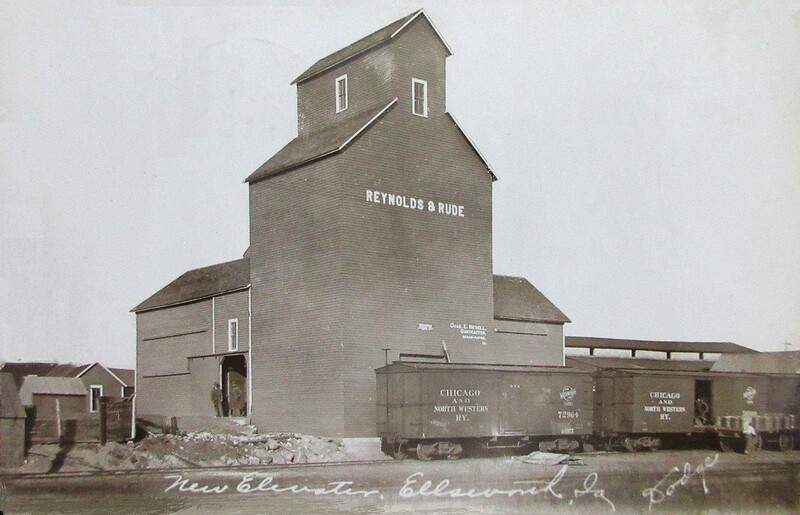 This image came from a postcard sent to Radcliffe. It says, "Will be over on the night train". 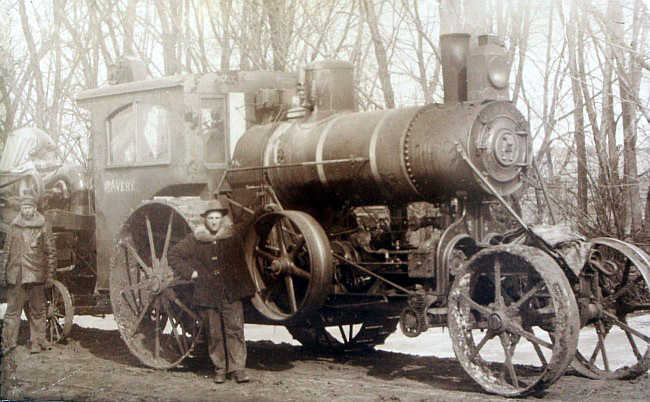 At this time, most did not have an automobile, and used a horse-drawn wagon or the train to travel to the next town. These students had their picture taken beside the old framed school previously shown on Page A. 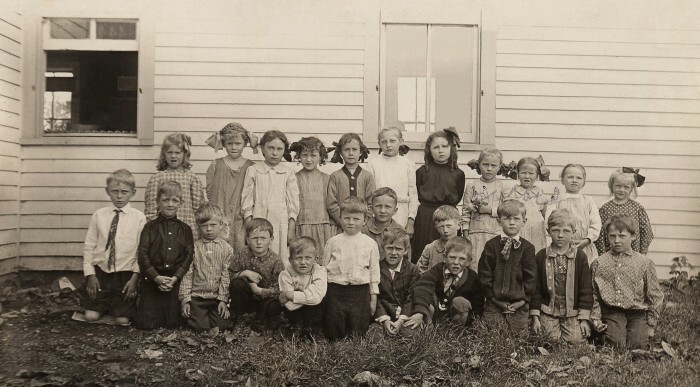 See more photos of this school and a map showing where it was located in the early Ellsworth days. 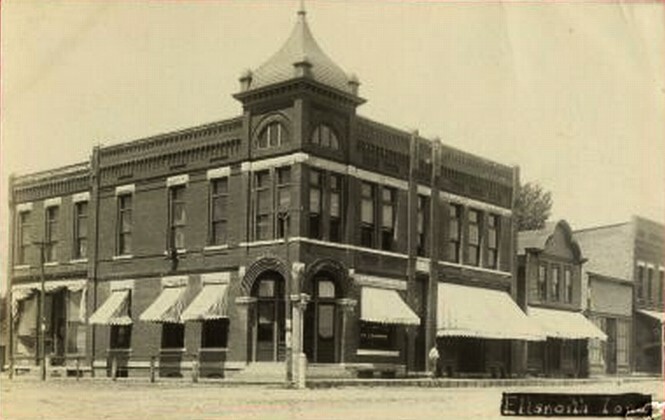 This is a 1907 image (looking southeast) of the 1903 Congregational Church building, located at the corner of Des Moines and DeWitt Streets. 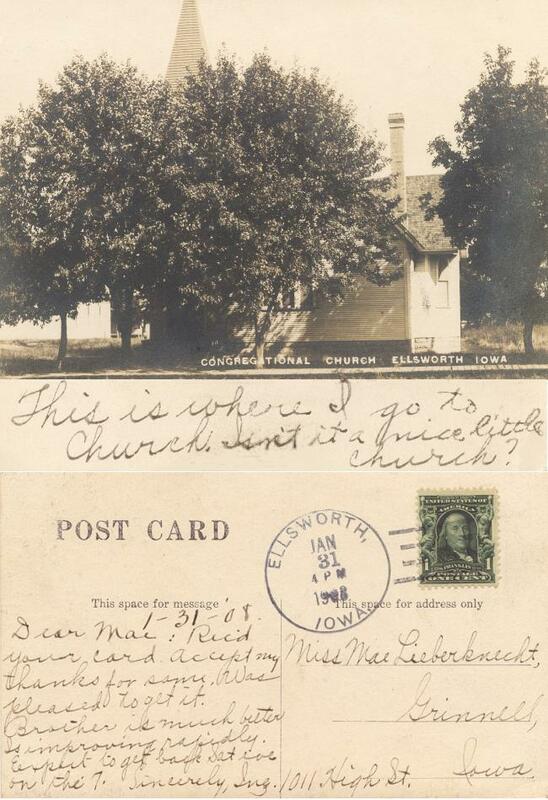 A postcard mailed in 1908 showed this same church building. 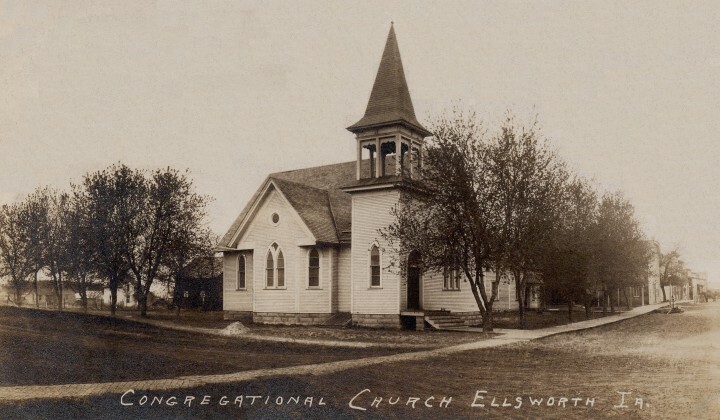 In 1912, the congregations of this Congregational Church and the Methodist Episcopal Church (seen above) began meeting together in this building with the name of Union Church. Union Aid Society will hold a turkey supper and bazaar Wednesday evening, October 29, in the church, the proceeds to be used to help redecorate the church. The menu: Turkey, Dressing, Mashed Potatoes, Gravy, String Beans, Cabbage Salad, Cranberries, Celery, Bread and Butter, Pumpkin Pie, Apple Pie and Coffee. Serving will begin at 5:00PM. Price, adults 40 cents, children 25 cents. Plans for redecorating the church bring back the early days of Union Aid society, as the time the church was last painted was in the spring of 1915. 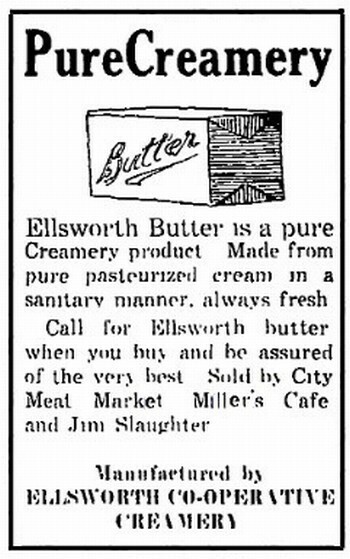 The society was organized on June 6, 1913. The first officers were: Mrs. F. O. Satter, president; Mrs. M. H. Brinton, vice president; Mrs. J. M. 0sbourne, secretary and Mrs. David Hawks, treasurer. Twelve charter members are still enrolled. 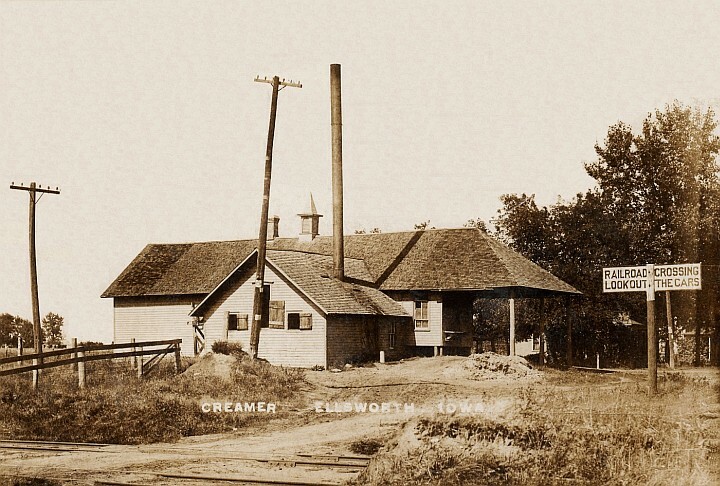 In 1905, the population of Ellsworth was 418. 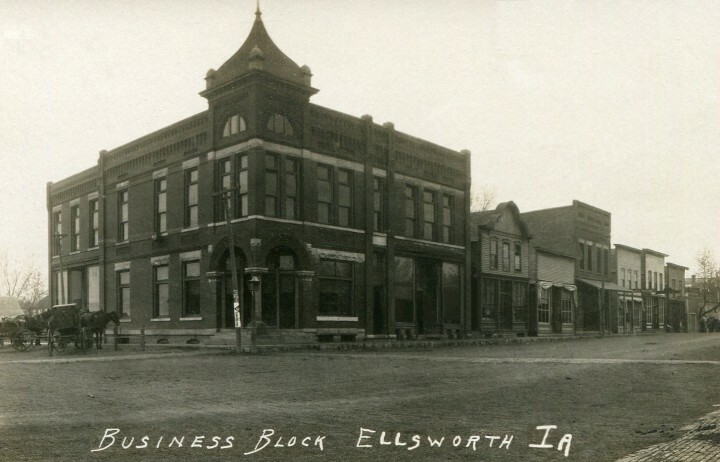 Contact us if you have Ellsworth photos you would share or if you have questions or suggestions. 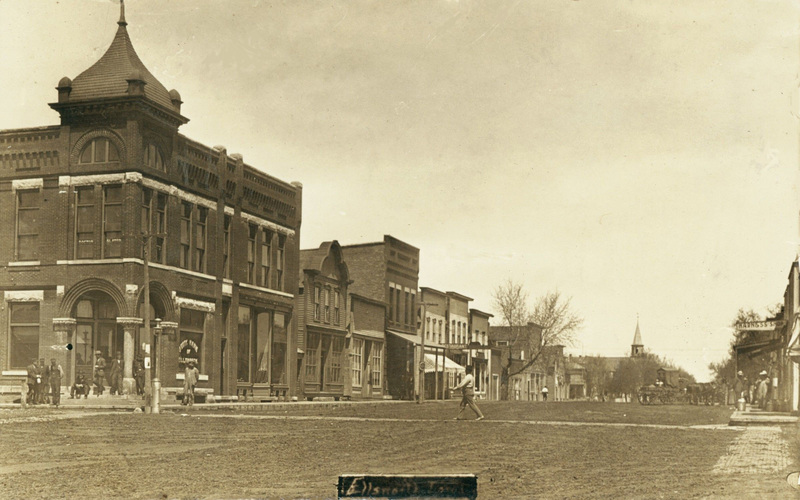 This 1907 street scene looks south on DeWitt Street from the Lutheran Church corner. 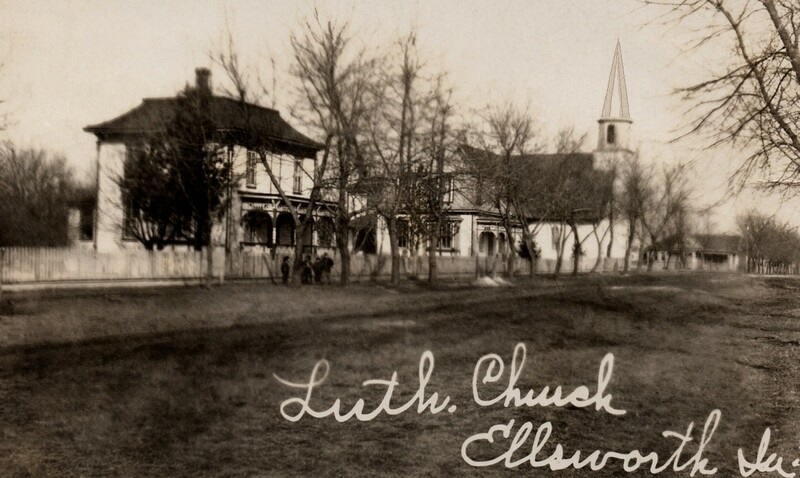 The large house at left was the Lutheran Church parsonage. The steps of the church are just visible at the extreme right. 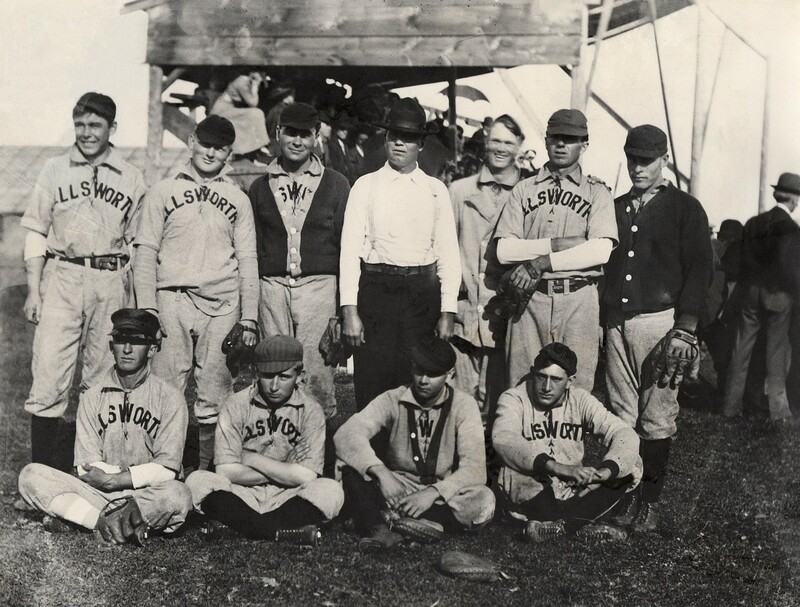 from the town of Ellsworth to John Gormon in Gowrie . The new A. Reynolds and H. E. Rude Company was located just north of the tracks. Changes on Main Street include new brick buildings. 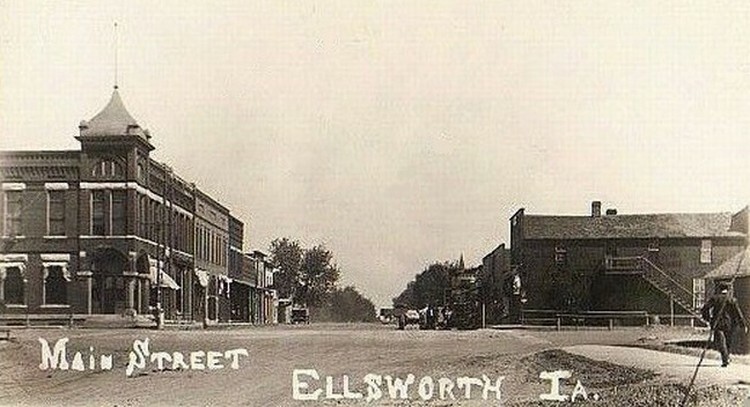 Here is another view of the Ellsworth Main Street, looking north. indicates "Happy" Andrew Thompson at left, and Otis Anfinson in the center. 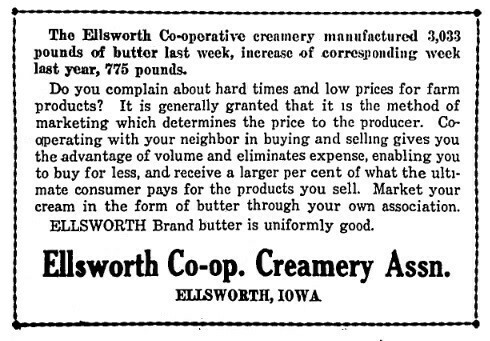 The next page shows Ellsworth "in the teens"